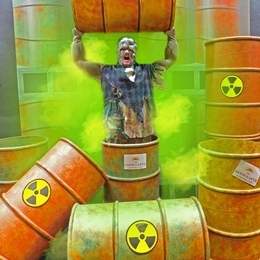 Sinclair Theatre will present an outrageous musical comedy with an environmental twist, The Toxic Avenger, April 7-15, in Blair Hall Theatre on the downtown Dayton campus. Directed by Chris Harmon with musical direction by David McKibben, the show is based on Lloyd Kaufman’s The Toxic Avenger films. This charming love story and laugh-out-loud musical features an unlikely hero, his beautiful girlfriend, a corrupt New Jersey mayor and bullies, mobsters, old ladies, and stiletto-wearing back-up singers. Written by Joe DiPietro and David Bryan, the subject matter is not suitable for children or the faint of heart! Tickets cost $18 for adults and $15 for students/seniors. Performances are at 8 p.m. on Fridays and Saturdays, and 2 p.m. for the Sunday, April 9th matinee. Weekday performances on Wednesday AND Thursday (April 12-13) are at 7 p.m. and cost only $10! ALL tickets are reserved seating and available online now at: www.sinclair.edu/tickets. In addition, all Thursday and Sunday performances are American Sign Language interpreted featuring Lacy C. Bryant Burkett and Charli Malloy as interpreters. Cast includes: Thomas Puckett, Courtney Kakac, Sha-lemar Davis, Elisha Chamberlin, Elisa Fuentes and Justin Lampkins.